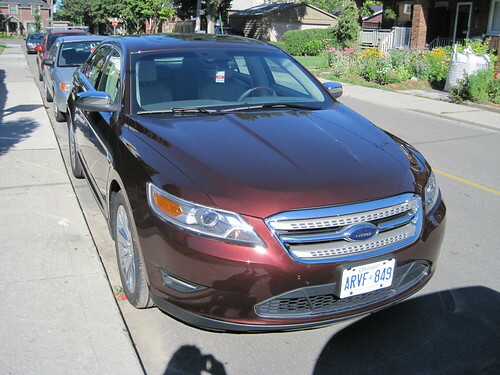 I've been driving a 2011 Ford Taurus SHO all week, but tomorrow it goes back to Ford. But instead of leaving Ford in my old '99 Mazda, I'll be leaving Ford with a brand spankin' new Ford Fiesta that literally arrived there today. I'll be taking that sucker camping, but before I swap the Taurus for the Fiesta, here are some final thoughts on the Taurus SHO. SHO stands for Super High Output, and that's a pretty good term for it. The 3.5-liter turbo V-6 is mighty powerful and a pleasure to drive. I found myself going way out of my way on highways just to drive it, it was that much fun. And the insides are ridiculously roomy. My Mazda's trunk can barely hold the baseball bag with bases and bats I slug around, but this Taurus trunk looks like it could fit four such bags. And this thing is comfy - from the Sync to the Sirius and keyless ignition, it's luxurious without being pretentious. When Ford lends you these cars, you get a print out of what it would cost to own. Because this Taurus is fully loaded, the sticker price ended up close to 50k. Yes, that's a little out of my price range, but that's not why the Taurus isn't for me. It's a big sedan, and I'm a smaller car kind of guy. We'll see what I think of the Fiesta tomorrow.